This is an excerpt from my essay “Scientia Populi: Citizen Science Media & Culture,” which will be included in an Arizona State University book about citizen science, slated for release next spring. Broadcasting, believe it or not, comes from farming. 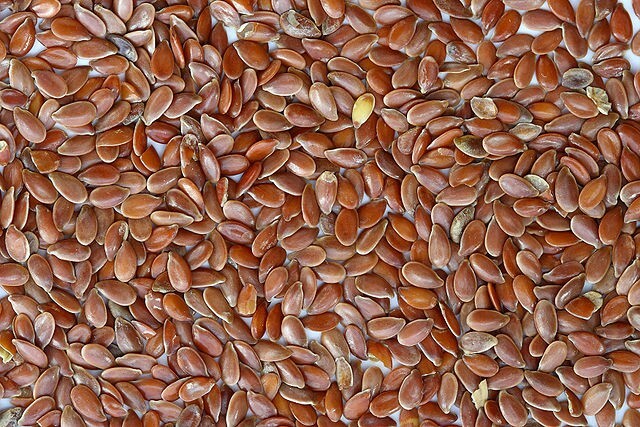 In modern vernacular, “to broadcast” means to transmit information by TV or radio, but the verb’s original definition meant “to scatter (seeds) by hand or machine rather than placing in drills or rows.” It may or may not come as a surprise to you that broadcasting has just as much to do with farming and media as it has to do with citizen science. In 1792, Robert B. Thomas started the Old Farmers’ Almanac, a periodical circulated widely and regularly to farmers. Still in publication today, the Almanac serves two important purposes: (1) It acts as an objective reference for weather and astronomical predictions, sourcing its observations from the farming community. (2) It facilitates a space where the community can share advice, anecdotes, recipes, and more with each other. Think about it this way: the Almanac is not far from how some citizen science efforts are built: it incorporates public knowledge into a larger corpus of information predicated upon a scientific question. The Almanac also illustrates another important concept — that this process does not happen in a vacuum. Citizen science imminently cultivates community. Thus, we might conjecture from the Almanac that communities often need a means of communicating to themselves and to each other. And that, dear reader, is where media comes in. When I say “media,” I’m referring to processes that facilitate the documentation, reporting, or construction of information. There is “mass media” (i.e. TV, radio, major news outlets) and what I call “micromedia” (i.e. blogs, social media, etc.) in both digital and non-digital contexts. You’ll see quickly, however, that the lines between both distinctions blur very quickly and very easily. 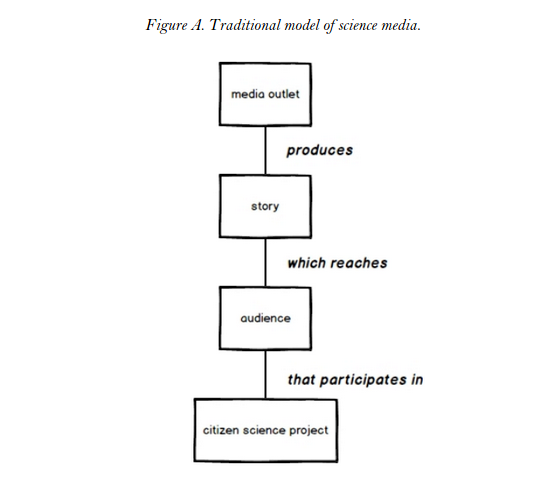 But before we even dive into the purpose of media in citizen science, it’s important first to discuss the purpose of media in science proper. Unsurprisingly, my literature scan for publications about “purpose” and “media” and “science” rendered results about journalism and public relations. This seems like the perfect locus at which to begin our conversation. In Journalism, Science, and Society, editors Martin W. Bauer and Massimiano Buchi bring together voices that provide a critical view of science and media. Tim Radford, the former science editor of the Guardian, identifies “a crucial tension in the focus of the mass media—particularly papers—on seeking a good narrative rather than seeking to advance public education as scientists sometimes seem to expect” (3). In a separate chapter, Pantarotto and Jori describe their conversation with a biomedical company in which the interviewee describes the company’s view on media: “Communication has two strategic purposes: firstly, to attract donations […] secondly, to maintain the image and reputation of the institute” (5). These views beg excruciatingly essential questions: Is science journalism, in essence, public relations for science and scientists, or is there a distinction between the two? If so, where is the distinction? What — if any — is the responsibility of media in terms of public education and understanding of science? How can media add value to the way the public discovers, accesses, and consumes scientific information? The answers to these questions depend largely on how you look at the role of media itself, which requires peeling back an additional layer. Media theorist James W. Carey presents two different models of communication that might be useful in helping us think through this. One is a transmission model, in which one party imparts information to another, like in traditional broadcast TV and radio. This is also a typically unidirectional relationship between media and people. The other is a ritualistic model, which is defined by things like sharing, participation, association, and fellowship. Based on what we know about citizen science and its collaborative involvement of the public, Carey’s ritualistic view of communication seems to lay along the line of best fit. 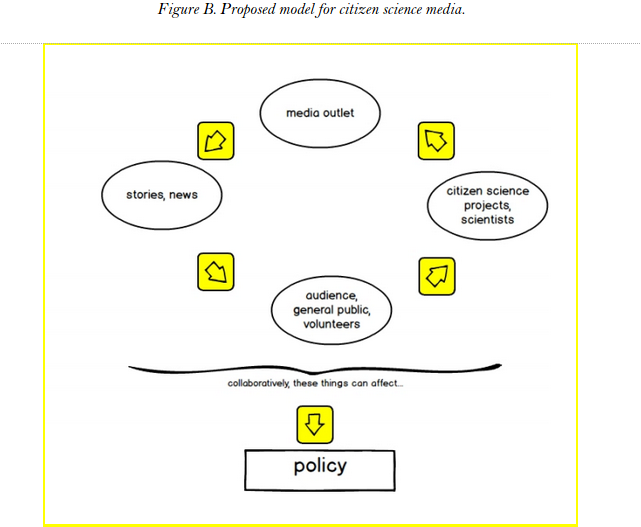 While traditional media relies on transmission, I propose that citizen science media should shift toward the participatory ritualistic model in order to raise public awareness about science, induct participants in citizen science projects, and close the feedback loop between the public, scientists, and media outlets. Stakeholders should foster a distributed approach to constructing the citizen science media discourse, and one camp that is accomplishing this very well is public media. Before I proceed, let’s get one thing straight: I am an unabashed public media nerd. You also know by now that I am an advocate for citizen science. Despite my embedded biases, however, the convergence of these two worlds speaks to a much larger narrative — that of citizen science as a form of public participation in science and public media as a forum for public discourse (Lowe & Martin 245). Shared mission. Public media is a mission-driven industry with its roots in public education and pedagogy, which aligns with the many citizen science projects that offer educational value by design. Both public media and citizen science also seek to raise awareness about relevant issues and to engage people beyond consuming information alone. National and local interests. Citizen science projects can bring light to very local issues (e.g. a dwindling frog population in southern Illinois) as well as national concerns (e.g. climate change) while providing a means to engage with these problems via a citizen science project. Public media often covers national and local issues, which can potentially be aligned with relevant citizen science projects that advance a related field of research. Infrastructure. Public media already has the infrastructure for disseminating content on air and online. Its organizing principle is also to create symbolic and material communities around public media content. Most citizen science projects constantly seek more participants and opportunities to build communities around citizen science. Volunteerism. Citizen science is rooted in the spirit of volunteerism, and many public media stations operate within the same credo. A citizen science project cannot be successful without volunteers to help collect data, and many public media stations rely on their volunteer networks to run events, promote programming, and in some cases even create content. Believe it or not, public media and citizen science have already met and hung out, with many case studies underway (and an alphabet soup of station call signs to boot). Every few weeks, producer Kimberly Haas from WHYY features a citizen science project with some kind of connection in the Philadelphia area, the broadcast region of the radio station. She interviews project managers, volunteers, and researchers about their work and encourages listeners to participate in the projects as long as the projects are active. These stories match with seasonal considerations. For example, a previous winter segment featured a citizen project called Tiny Terrors, which focuses on identifying the invasive woody adelgid. The story was framed by the context of winter in the Northeast, where the types of trees susceptible to the woody adelgid grow. The Pulse also runs stories on many other types of citizen science stories. iSeeChange is a citizen science project and public radio experiment that ties citizen observations of weather directly into media. Participants submit weather observations in the form of photos, video, or tweets, which can potentially be incorporated into news stories about climate change. This model opens up the newsroom and brings both public radio listeners and citizen scientists into the data gathering and storytelling process. The WNYC data news team ran two citizen science experiments involving sensor-generated data. The first, Cicada Tracker, involved garnering public radio listeners to build an Arduino-based soil temperature sensor and submitting regular readings to the WNYC team via a simple data app online. The goal was to see whether there was a correlation between increases in soil temperature and the frequency of cicada sightings (there was). As people submitted their sensor readings, the data news team mapped the data points on a CartoDB map and also blogged about the process along the way. Similarly, the Clock Your Sleep project involved people with JawBone wearable sensors to track their sleep patterns and self-report their sleeping patterns through a smartphone app. The data were collected, analyzed, visualized, and reported on via the WNYC website. WCVE Idea Stations has also used their platforms to connect their audiences to citizen science. They have featured regular blog posts, audio, video, and even live events that bring people to citizen science opportunities like FrogWatchUSA, the Great Backyard Bird Count, and Cicada Watch. The educational arm of Science Friday seeks ways to repurpose existing Science Friday content for education and the general public. SciFri has featured citizen science projects on its education page in the past and enlisted its audience to participate. Their latest project engages online listeners to tweet observations about the world using the #ObserveEverything hashtag, appealing to a historical tradition of observation-based science, which citizen science draws upon often. NOVA Science is known for its production of science documentaries for public broadcasting. Recently, they launched an initiative called NOVA Labs, which are citizen science projects hosted on the NOVA website. The various labs that citizen scientists can participate in span fields like solar energy, RNA, cybersecurity, and more. In tandem with the companion educators materials (videos, interactive documentaries, and other content) already available through the site, NOVA Labs is meant to be a resource for educators, students, researchers, and citizen scientists alike. Needless to say, I hope that public media does more with citizen science, and I hope that citizen science does more with public media. In these collaborations, there is certainly potential to create more dialogue between news outlets and the public when it comes to scientific inquiry, investigation, and pedagogy. Barrett, Diana & Sheila Leddy. “Assessing Creative Media’s Social Impact.” The Fledgling Fund. White paper. 2008. Bauer, Martin W. & Massimiano Buchi. Journalism, Science and Society: Science Communication Between News and Public Relations. Routledge: New York, NY. 2007. Brumfiel, Geoff. “Science journalism: Supplanting the old media?” Nature. Published 18 March 2009. Accessed 28 September 2014. Carey, James W. “A Cultural Approach to Communication.” Communication as Culture: Essays on Media and Society. Unwin Hyman: Boston, MA. pp. 13–35. 1989. Lowe, Gregory F. & Fiona Martin (eds). The Value of Public Service Media. RIPE@2013. Nordicom: Goteberg, Sweden. 2013. Walsh, Lydia. “The Common Topoi of STEM Discourse: An Apologia and Methodological Proposal, With Pilot Survey.” SAGE Pubications. 2010. Lily Bui is ​a researcher and M.S. candidate for MIT’s Comparative Media Studies program. Most recently, she has been a STEM Story Project Associate at the Public Radio Exchange (PRX); the Executive Editor at SciStarter, PLOS CitizenSci, and Discover Magazine’s Citizen Science Salon. In past lives, she has helped produce the radio show Re:sound for the Third Coast International Audio Festival out of WBEZ Chicago​;​ worked on Capitol Hill in Washington, D.C.; served in AmeriCorps in Montgomery County, Maryland; worked for a New York Times bestselling ghostwriter; and performed as a touring musician.In her spare time, she t​inkers with electronics and t​hinks of cheesy science puns.